The mockingbird comes up out of the sun over the saddle behind me, flies past my left shoulder, and drops down into the Valley Of Death. Only as it flies away, below me now with the sun on it, do I realize it is a mockingbird. Those who have seen a mockingbird harass a cat know this is a fearless species. Those who have seen a mockingbird in “flight display” or two males in a “boundary dance” will assume this is a relatively aerobatic species. But everything in the avian world is relative. In the very moment of my realization that this is, indeed, a mockingbird, I have a flash of intuitionthis is one brave mockingbird or one that hasn’t been paying attention to what is happening in its neighborhood. In the next moment, just as I laugh at myself because most of the time as one observes birds and subconsciously predicts what will happen next the observer is wrong, a dark streak sweeps down across my peripheral vision. My intuition was right! Some things in nature are inevitable. I am perched on a promontory overlooking a high, boulder strewn cirque on a granite mountain glowing softly red in early morning splendor. Though my perch is not precarious, if I were to slip I would roll a long way. Sheer rock walls rise above me to my right, farther to the top than the slope below me is to the bottom. One section of the summit of this huge cliff face is a large, rounded formation resembling nothing so much as a giant owl’s head, two circular caves or grottoes, one on each side at the same height, the “owl’s” eyes. The cave on the left, closest to its aerie, is the male Peregrine’s favored perch. He is a stunning Peregrine with a full black “helmet,” his chest and belly glowing brightly in the rising sun. Even without bringing my binoculars up, this bright glow has been my visual proof that he is on watch. Now, as my brain momentarily lags behind both intuition and peripheral vision, I glance up to the owl’s eye. The bright glow is gone! I snap fully aware of the dark streak and refocus instantly out over the cirque below me. I am a moment late. Just as my eyes refind it, the mockingbird’s flight trajectory intersects the dark steak of death that is the stooping Peregrine. At this nexus of focus, mockingbird, and Peregrine there is an explosion of feathers. Feather rain falls on the slope below me. There are two givens in the avian world: all birds are either predator or prey; Peregrines in stoop are the fastest of avian species. Nature can be quick too. From mockingbird identification to mockingbird death has taken just a handful of seconds, and the Peregrine’s stoop has proven faster than the human eye. Here are my field notes from a morning below the aerie. 5:30amSomewhere down below, behind the saddle that is behind me, official sunrise is just taking place. It will be awhile before sunlight gets over the saddle and illuminates the cirque. 5:50amShrill, piercing screams focus my attention. Both Peregrines, he from the Owl’s Head above, she from somewhere out on Graffiti Point, converge on the scrape just visible below the long diagonal seam in the striated wall of the rock face. I do not catch their flight quickly enough to discern prey, but the echoed cacophony of begging cries from the young confirm this is probably breakfast, the first feeding of the day. 6:25amThe southeast wall of the cirque is now bathed in sunlight, the aerie still in shade. The male has been gone for some time, out hunting while his mate remains silhouetted against the western sky on the south promontory of Graffiti Point. His calls announce his return and launch her, and my binoculars, toward the scrape. He drops in with undetermined prey in talons as she arrives. She takes it from him and hops behind the wall which shields the interior of the aerie from my sight. Four nestlings, almost full grown but still flightless, hop/waddle frantically, comically, across the scrape and disappear behind the wall. The cacophony begins anew. 7:00amThe female Peregrine flies to the aerie by herself, obviously with prey, but remains out in the open area of the scrape. This is the third feeding of the day, and the 5:50 and 6:25 scenes repeat. The female is larger than her mate, but her “helmet” is not full like his, just a wide black stirrup, or comma, below her eye offset by a large white cheek patch. Holding the prey item down with one talon, she rips and shreds with the tip of her beak and its tomial teeth, plucking feathers, pulling off appendages, distributing morsels to each of the four clamoring young. 7:20amThe mockingbird intersects death and is deposited on the scrape by the male. His mate comes immediately from the wall somewhere above and behind me and takes over feeding. Last year three young were produced. This pair of adults has been together several years, and four young is a good year, probably the average maximum for the American southwest. 7:50amThe fifth feeding with prey brought to the aerie by the male and “processed” by the female amidst more clamor and feathers. The male never stays for the feeding nor feeds the young himself. Sorry for the anthropological aside, but what husband would with four hungry, raucous, querulous teenagers? 8:45amSixth visit, female only. This feeding appears to be another bird as quick binocular views seem to show avian legs and feet. 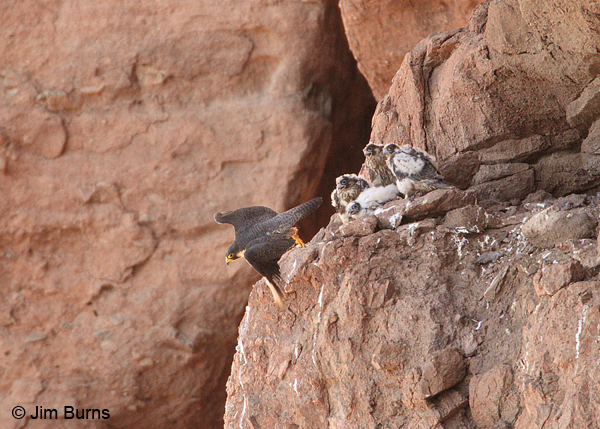 Peregrines are bird specialists, readily take bats where available, and only occasionally are seen with mammalian prey. I personally have seen this pair with Mourning Doves, White-throated Swifts, European Starlings, and Gila Woodpeckers, in that descending order of frequency. And now a Northern Mockingbird. Earlier on this morning I saw the male stoop on a flying Rock Wren, but miss. 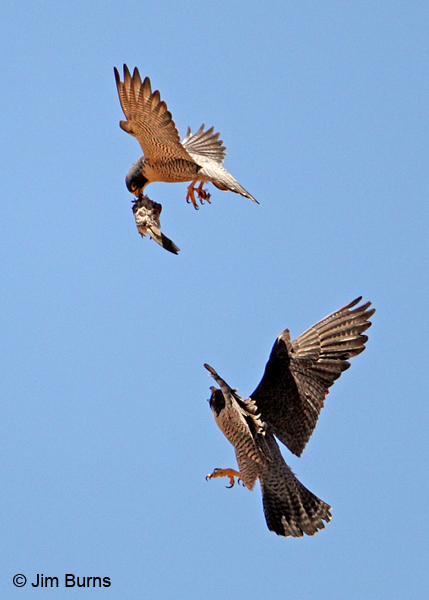 A “catholicity” of avian prey is why the Peregrine Falcon is one of the most widely distributed birds on the planet. 10:15amSeventh visit, female only. Whenever either adult flies to a rock perch after a feeding, it is immediately harassed by at least two hummingbirds. The default hummer in this cirque is Anna’s, and even from a great distance, through binoculars or the camera lens, harassing Anna’s are discernible around the perched falcons like gnats diving and darting, but only for a minute or two after the raptor first arrives on its perch. This harassment almost always takes place, and the falcons appear oblivious. One would presume hummingbirds are too small an item to be of interest to a Peregrine but, if so, why would this hummer behavior have evolved? 11:20amHere is the event for which I’ve been waiting and hoping, a prey exchange in midair out over the cirque away from the aerie. It is typical of others I have witnessed, but always aerobatically spectacular nonetheless. I’ve lost track of where the female is perched or she is nowhere to be seen. The male flies in with prey item, this one a Mourning Dove, in his talons and begins circling and calling from a height at or above the top of the cliff face, whereupon the female flies out into the cirque below him. He deploys his alula and hovers while she flies up below him, answering his calls. Just as she reaches her mate she flips over and, upside down now, grasps the prey from him, usually talons to talons, but sometimes he transfers the item from his talons to his beak as she arrives. In this case, his nictitating membrane and eyelid both close to protect his eyes. Once she has secured the item she flips back over and falls away, often beginning to pluck the prey on the wing back to aerie or to her own perch if the young have been well fed for the morning. Twice in these exchanges I have seen prey fumbled. On both occasions the male flew under the falling prey, tipped backward to perpendicular, legs extended outward, and snatched the recently deceased bird out of the air with outstretched talons. Once a few years back I watched this same pair of Peregrines apparently “playing” with a White-throated Swift they had dispatched, one dropping, the other recovering then dropping for the first to recover, not leapfrogging but dropfrogging down a cliff face, and the recovery was less a snatching than a simple and elegant catching, the luckless swift’s body allowed to fall and settle into the lower falcon’s waiting basket or webbing of claws. All this on the urban side of the mountain hundreds of feet above hikers totally unaware of nature’s spectacular drama playing out directly above their heads. Mockingbirds, now common and tame throughout city neighborhoods, hardly seem wild to urbanites. Peregrines, despite their increasing usage of cityscapes for their nesting cycle, are forever wild. One part of it lies in the definition of “predator,” another part in the etymology of “peregrine.” Wanderer. Foreigner. Pilgrim. The Peregrine can be taken from the wild, but not the wild from the Peregrine. Nor from our species. “Peregrine” speaks to an ancient linkage buried deep within the human DNA. Peregrines live in our genetic memory. Their continuing recovery from the DDT years is a necessity for the human soul.